Last week, a troll YouTuber TechRax made a tongue-in-cheek video “helping out” the people who wanted a 3.5mm headphone jack in their new iPhone 7. 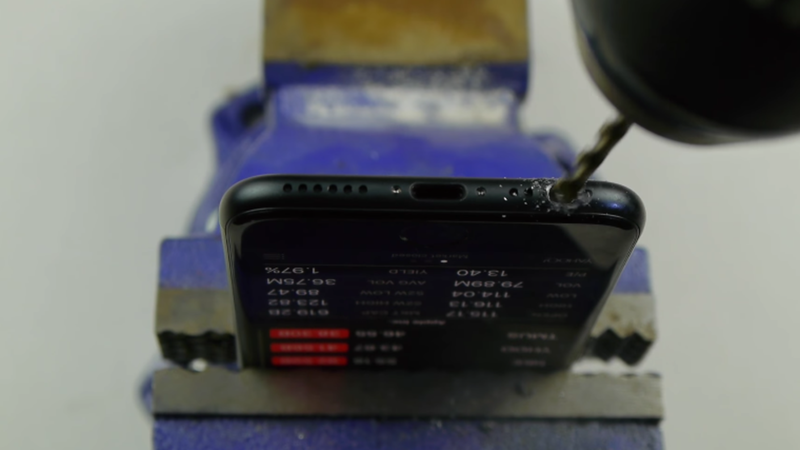 The viral video, which has been featured on national news and has racked up more than 10 million views, shows the owner putting his new iPhone 7 between a vice, and then actually drilling a 3.5mm hole into the speaker grill using a drill-bit. Obviously, people with even an iota of common sense would know that this is a fake video and just to make people laugh. But it rather became a prank video, as many people were found complaining in the comment’s that they actually tried it and it didn’t work for them. The panicked people have been cursing the uploader, still in disbelief that they actually ruined their iPhone. This man is still trying to “fix” the problem by downloading a headphone jack app, although it seems as though his phone is gone for good. At least this person’s headphone fix, so that’s one thing off his mind. And as the video went viral, it attracted many other trolls. This man is seen “advising” an out of sorts iPhone user to put his phone inside a microwave for 3 minutes to “bond the broken wires”. Nice one! Another troll trying to score some free iPhones. And there is every chance that he would have received some too! This guy knows what’s up! And finally, this man goes one step ahead and suggests a horizontal cut to create a memory card slot. 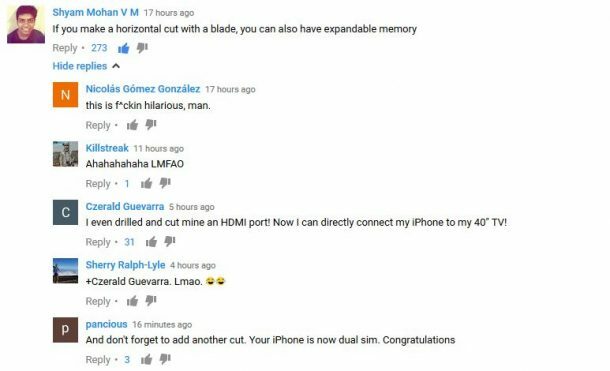 He is responded with a man who already has “cut” a HDMI port and a dual sim! The trolling just never ends here! This is not the first time iPhone owners have been pranked into destroying their phones. We have already seen people frying their phones by trying to charge it using a microwave. But this one has certainly taken home the gold prize! Please don’t fall for the prank, use the iPhone dongle if you miss the headphone jack so much!